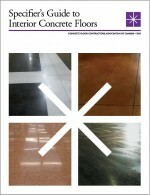 In addition to the many changes in this standard, there is a new concrete mix classification “N-CF” for “interior concrete floors with a steel trowel finish” which includes mandatory maximum 0.55 water:cement ratio and a minimum 25 MPa compressive strength (both requirements must be met see Clause 4.1.1.1.3). Steel fibres must be accompanied by a Certificate of Compliance and Test Reports in accordance with ASTM A820. Under-slab vapour retarders shall be installed in areas with non-breathing finishes and shall comply with ASTM E1745 and ASTM E1643. Granular bases shall be level to +/- 10mm prior to ordering a concrete placement (see Position Statement). The average slab on grade thickness shall be no more than 10mm less than the specified thickness and no local variations in excess of 20mm less than the specified thickness. Owners shall specify concrete mixes, curing and reinforcing as necessary to control drying shrinkage curling to meet their specific needs. Sawcut contraction joints shall be spaced at approximately 25 times the slab thickness in metres and shall not exceed 4.5m on centre. Semi-rigid joint fillers should not be filled earlier than 120 days after slab casting (see Position Statement). The Concrete Purchaser must make suitable arrangements for the plastic protection of the concrete mix being used (see Position Statement). Surface tolerances shall be measured within 72 hours of slab casting (See Position Statement). Levelness tolerances do not apply to suspended slabs. The minimum local value (60% of overall specified value) must be exceeded in all slab areas. A machine trowel finish shall not be used on air entrained concrete to avoid the potential for surface delaminations. Concrete mixes for floors should have a MINIMUM slump of 100 mm at the point of placement. General use cement may be modified with up to 15% inter-ground limestone (Type “GUL” cement). Test method 16C permits the on-site washout of both steel and syntehtic fibres to determine the average content in concrete on site.